D&S Enterprises is a design developer of onsite wastewater treatment systems (commonly referred to as septic systems) based on the specific soil inventory of your site. 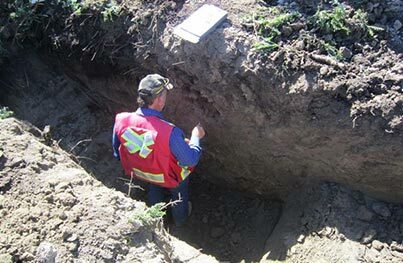 Our site and soil evaluations are what determine the type of soil based septic system that will perform best for your site and soil conditions. We are AOWMA (Alberta Onsite Wastewater Management Association) members, Alberta Municipal Affairs certified, NAWT (National Association of Wastewater Technicians) members, NAWT certified and have over 25 years of experience in the installation and design of residential and commercial septic systems. We provide design services to all areas within Alberta, however concentrate our design work in the Southern Alberta region. Our septic designs satisfy all specified regulations, site specific soil requirements and offer the most cost effective design for homeowners and septic system installers alike. You can be confident that the system we design for you will work for your property and individual site and soil requirements. We have established quality relationships with septic system installers and with suppliers of all components within the wastewater management system. You can be assured that we'll recommend only qualified contractors and that only quality septic tanks and field componentry will be specified. Designs – its our dirty secret! © Copyright D&S Enterprises Wastewater Design, 2012 - 2019. All Rights Reserved. Septic system design & wastewater design & treatment systems for contractors and landowners – Calgary and area / Southern Alberta. Contact: Daniel Morris, Wastewater Design Specialist. P: (403) 652-0348. A: Box 5937, High River, AB T1V 1P6.